McCain is opening a Roastarant pop-up at The Old Truman's Brewery in Brick Lane from Friday 8th - Sunday 10th December 2017. Daytime sittings cost £7.50 and give you a roast with roast potatoes and a choice of 5 different gravies. Evening sittings cost just £5, but are just for the potatoes and gravy. As you might imagine tickets are going fast - don't miss our on this very special pop-up! "This December, McCain is throwing out the roast dinner rulebook and opening the doors to its own speciality restaurant, the Roastaurant, to celebrate the diversity of one of the nation’s favourite meals. Following research by McCain, which revealed unconventional versions of the Sunday dinner stalwart are on the rise, the Roastaurant is designed for people to enjoy their perfect Roast combination and ultimately help settle the Great Roast Debate. Open from 8-10 December at the Old Truman Brewery, the Roastaurant will provide roast dinner lovers the choice of over 100,000 possible roast combinations in a pick ‘n’ mix style menu which have been based off the research findings. Featuring a unique ‘gravy microbrewery’, similar to a craft ale tap room, and a giant six metre squared roast potato platter filled with thousands of McCain Roasts, the Roastaurant is set to bring the ultimate roast dinner debate experience to London. To accommodate all roast dinner habits, no matter how quirky they may be, the menu will feature a much broader choice of items on offer then what you’d usually expect to see on a roast dinner plate. Whether it’s pigeon with onion rings covered in chocolate gravy, 0r beef brisket accompanied with a fried egg and a side of charred pineapple, the McCain Roastaurant will be dishing up a whole host of exploratory roast combinations. With 85 per cent of the country believing that roast potatoes are the only indisputable item on a roast dinner plate, the only constant on the menu will be crisp and fluffy McCain Roasts that are made just as you would at home – basted, never battered - for a perfect golden, crispy finish. 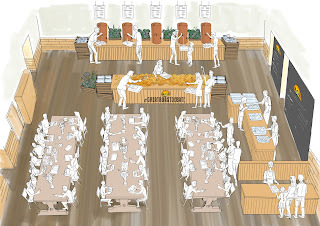 During the day, the Roastaurant will offer a sit down roast dinner experience, with all the trimmings and avoid arguments on what should and shouldn’t be on the plate, diners will choose from a ‘tick box’ style menu, allowing them to choose exactly which meat, sides and condiments they’d like. In the evening, the space will transform into an interactive ‘gravy microbrewery’ and McCain Roasts experience that offers five different types of gravy including unique flavour choices, chocolate and jerk. Diners will be able to visit a giant self-service McCain Roasts platter and fill their bowls with as many crispy and fluffy McCain Roasts and gravy as they’d like!"